Would you like a light scarf to wear on a summer evening? The weather is warm, but the sun has gone down and a little something around your shoulders just makes all the difference. Or perhaps you're looking for your next knitting project, and fancy trying your hand at lace? Donna Smith's Aphaca scarf is the first pattern in our new book, Something New to Learn About Lace. Donna Smith has created this pretty scarf and accompanying blanket design to allow you to practise basic lace skills, including working yarn overs, reading lace charts and blocking your lace knitting. The edging pattern is a Madeira lace, which creates a gently scalloped edge to the scarf, and the centre lace pattern is a triplet motif, which is very straightforward with plenty of rest rows. Our model Sue is one of my great friends here in Frome, and she is also a very keen knitter. She's worked her way through almost all of the projects in A Year of Techniques, and is looking forward to casting on an Aphaca scarf of her own. The scarf uses three skeins of Something to Knit With 4ply, and Sue is trying to choose between a kit in Mist (as shown) and Sea. Aphaca scarf yarn kits cost £22.50 and include three skeins of yarn plus a Something New to Learn project bag. The scarf is worked in two pieces and grafted together in the centre. This ensures both ends of the scarf are symmetrical when they hang around your neck. Donna is constantly inspired by the beautiful surroundings of her home in Shetland, and has recently produced her own yarn range, Langsoond, which is spun from the fleeces of her Dad's flock, and those of her neighbours. Donna has an amazing way of putting together simple ideas to create patterns that are quietly elegant. The Aphaca blanket is the bigger cousin of the scarf, and comes in three different sizes, using 4, 7 or 11 skeins of Something to Knit With 4ply. The photos here show the small blanket in shade Beach. We had such fun taking photos with Tina and Edie – I've never met such a happy and content baby! She was a complete superstar! Thank you Tina. The Aphaca blanket is made in a similar fashion to the scarf, except that the two sections are grafted together adjacent to the second edging (rather than in the centre). 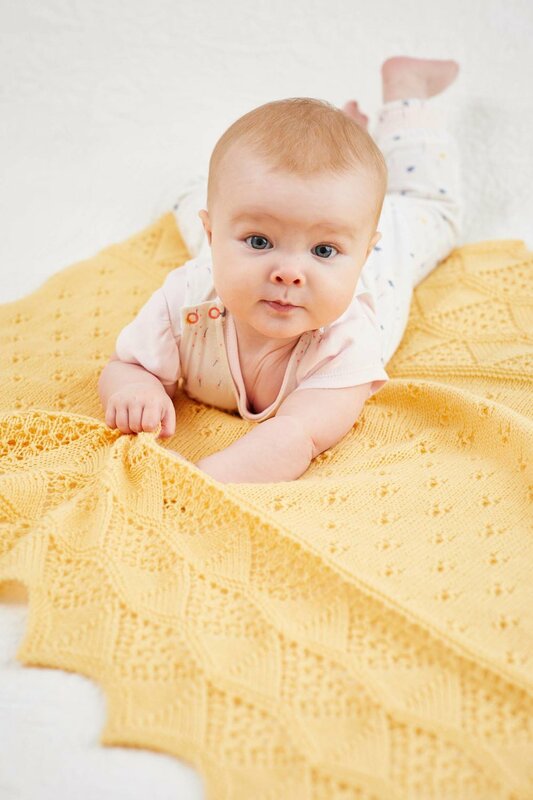 The small size blanket is perfect for a cot or buggy blankie, whilst the large size would look great on a single bed. Aphaca blanket yarn kits are available in our online shop, priced between £30 and £80 depending on size, and you can choose from all ten shades of yarn. Along with these first patterns in Something New to Learn About Lace, there are a set of crystal-clear photo tutorials to walk you through the basics of knitting lace. There's a section on reading charts, and using charts to read your knitting, as well as how to work yarn overs in all sorts of different situations. We will be releasing video tutorials to accompany some of the techniques showcased in the book over the coming weeks, so keep an eye on the blog and our YouTube channel so that you don't miss them. The Something New to Learn About Lace knitalong will run through July and August in our Ravelry group, so choose your pattern (any pattern with lace is fine!) and come and join us. We will be back on Monday to reveal Martina Behm's gorgeous Nissolia shawl, so to be sure of not missing the blog post, why not subscribe to receive it directly in your email inbox? Sign up by clicking the button below, and never miss a post. All of the images in this post are © Jesse Wild, our amazing photographer, without whom I would never agree to be in a photo!